Handy Helpers Curved Mezzaluna Chopping Knife Only $6.29 Down From $19.99! Ships FREE! You are here: Home / Great Deals / Handy Helpers Curved Mezzaluna Chopping Knife Only $6.29 Down From $19.99! Ships FREE! GearXS has this Handy Helpers Curved Mezzaluna Chopping Knife on sale for $6.29 (Reg. $19.99) when you use promo code HOP + FREE shipping! 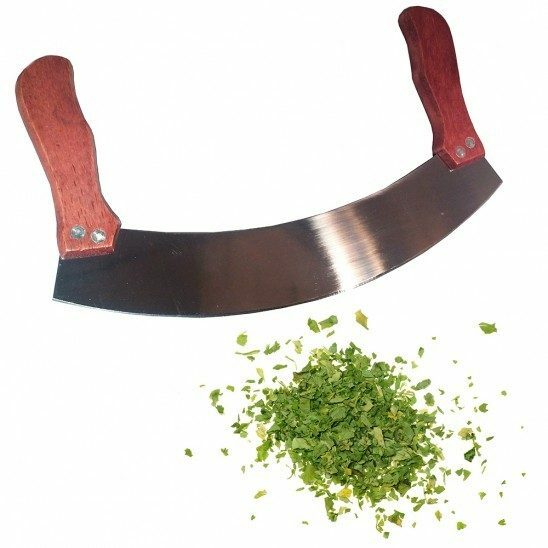 Perfect for chopping vegetables or mincing herbs, this Curved Mezzaluna Chopping Knife features an extremely sharp curved stainless steel blade and wooden handles. With a 10″ blade ensures a perfect cut quickly and easily with a simple rocking motion.